The Utah Department of Health recently released the 2017 Utah Adolescent Health Report. KPCW spoke with Summit County Health Department to gain insight from the report. The 2017 Utah Adolescent Health Report was released in October and looks at the wellbeing of youth in the state. Summit County Mental Health Director Aaron Newman points out that Summit County’s numbers had some variation from the state. Newman says that they’re working to help students deal with feelings of hopelessness and depression. The report saw significant increases from 2013 to 2017 in youth reporting feeling sad or hopeless. That jumped from 20.8% to 27.3% percent. Suicide Ideation jumped from 14.1% to 18.1% and making a suicide attempt went from 6.2% to 7.7%. On Friday, November 5th a Treasure Mountain student was taken to the hospital after passing out due vaping a product that contained THC. 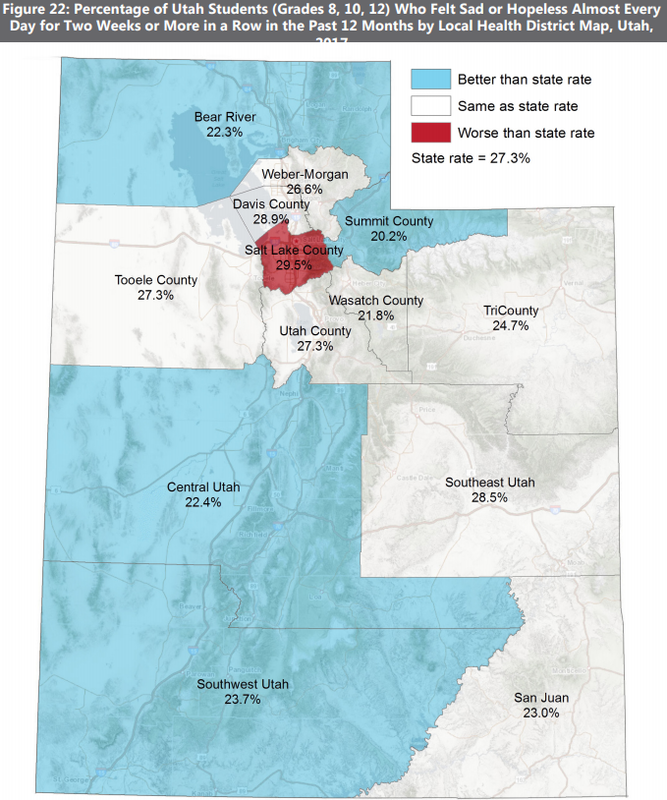 Although cigarette smoking is down significantly, the study saw that Utah adolescents who use a vape product or e-cigarette nearly doubled from 5.8% to 11.1% statewide. In Park City vape use is even higher. District Communications Director, Melinda Colton does not know if the child overdosed, just that the student passed out at school. The Summit County Health Department and their partners are launching a campaign to encourage residents to phase out their wood-burning fireplaces. The coalition just received a grant of $120,000 from the EPA to help in the effort. A couple of years ago, the Snyderville Planning Commission restricted wood-burning fireplaces in all new construction.